So much more goes into analysis of a player than his cumulative fantasy points at the end of each season on which many bust claims are built upon. Sure, if you invest a premium pick, even at a position that is historically the most fragile, you expect a certain amount production week-in and week-out. These expectations, especially early in the year, can cloud your memory of a player the next season if that player didn’t live up to their average draft position the year before. What many people think of when they hear the name C.J. Anderson is his inexplicably slow start, and they disregard the overall apocalypse at running back in 2015. Anderson totaled just 180 yards on 67 attempts and no touchdowns on the ground through the first six weeks of the season, but finished as one of the league's best over the second half of the season right through the Super Bowl. The reasons that everyone liked Anderson going into last year are still very applicable to 2016, the biggest of which is that he is a perfect fit in head coach Gary Kubiak’s run-heavy system. Aside from last season, Kubiak has a long history of featuring his running backs and making them a focal point of his offense. The main reason last year was different was that Anderson was banged up. Everything the Broncos have done so far this offseason would make you believe they want win games by being dominant running the football and playing good defense. Last year was an outlier for Kubiak, as the Broncos had a 20-touch back just three times. From 2013-2014, Kubiak's teams saw a 20-touch back in 47% of his games. If Anderson can put together a healthier season than he has in the past, he could be in for an enormous level of volume. Speaking of injuries, given Anderson’s peculiar start the year; I wish I had considered making an exception to my game selection process. Anderson’s 2015 Rushing Expectation sample does not include playoff games and this is definitely something I will be more flexible about going forward. I typically only use playoff games if the season sample size is too small to hit my threshold (e.g., Spencer Ware). Anderson’s two “worst games” sampled were from early in the season where when he was most likely battling ankle and turf toe injuries. You can learn more about how I identify what individual games to sample in my introduction found here. The easy thing to do would be to ignore the relevance of the above, given Anderson still had significant volume in these early season games, but it still has to be taken into consideration. Anderson is the type of back that hits holes extremely hard, but at the same time is smart enough to anticipate his blocks on the interior. His former quarterback, Peyton Manning, has said that Anderson is the smartest running back in the league. This elite football IQ may be Anderson’s best attribute, and it is undoubtedly one of the reasons Manning went to bat for Anderson amidst higher draft capital. An overwhelming percentage of Anderson's total rush attempts came through the middle or behind left or right tackle, a pretty standard trend among most running backs in my initial 20-player sample. 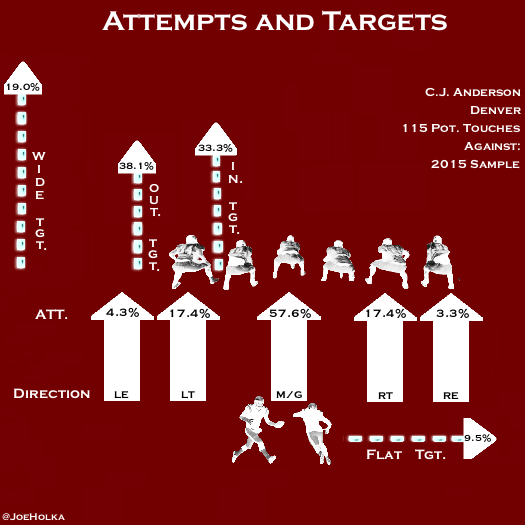 Anderson's targets in the passing game represented 20% of his total potential attempts (rush attempts plus targets). This was just below sample average and unfortunately magnifies his mistakes. Anderson is good in the passing game, but is not rare or unique as a receiver by any stretch. His 23 targets were relatively evenly distributed through all areas of the field outside of the flat, where he was targeted was well below average (9.5%). Expected Success Rate (eSR) is the signature metric of Rushing Expectation and highlights the fact that not every Success Rate (SR) is created equal. Offensive lines have a direct correlation with running back success, and how far a running back falls below or exceeds expectation is extremely relevant. If you are new to this series, you can learn more about this metric in my introduction video or article found here. While offensive lines show a direct correlation to running back success, a running back's skill also plays a part. Let's look and see how Anderson performed in comparison to what was expected behind the Broncos offensive line. The overall eSR for Anderson was 42.3% per rushing attempt, 18th in the NFL but below the NFL average of 44.3%. Denver was also an average team in pass protection at 43.4% expectation, hovering right around the league average of 43.9% eSR. The good news is the Broncos beefed up their offensive line in the draft and also added a legitimate fullback. 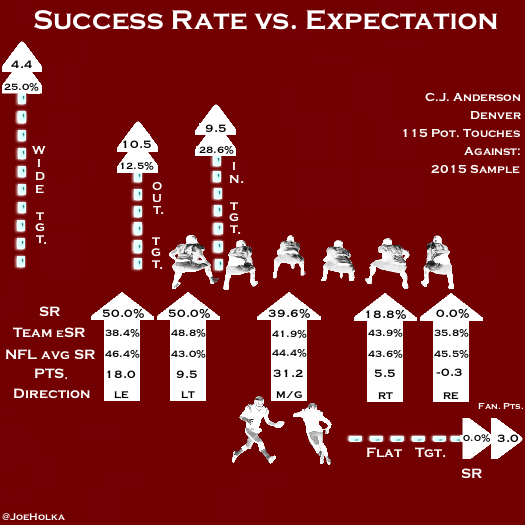 Anderson struggled mightily rushing up the middle (his largest sample) with a 39.6% SR. This was the second-worst SR through the middle lane of any player in my initial 20-player sample; just ahead of Latavius Murray (39.1%) and behind Melvin Gordon (39.7%). As for the small distribution of runs to other lanes, Anderson also performed well below his eSR and the NFL average to the right side of the field. Anderson has good athletic ability, and although he plays with quickness, he lacks lateral agility at full speed and into the second level. But like we talked about earlier in this series regarding Ware, long speed is highly overrated at the running back position. Anderson has good burst despite average top speed. He makes up for this with unique mental processing and rare vision, which are arguably much more predictive of success. In the receiving game, Anderson performed below expectation in every area of the field. He was most effective through the inside, where he posted a 28.6% SR, a staggering -14.8% below his eSR. With the community down on Anderson this season despite him being in seemingly the same or an even better situation than last year, one might think the bearishness has to do with his cumulative efficiency struggles. Are fantasy owners weighing Anderson's season totals far too heavily? Let’s check out his overall Rushing Expectation results and gather more clues as to what to expect going forward. 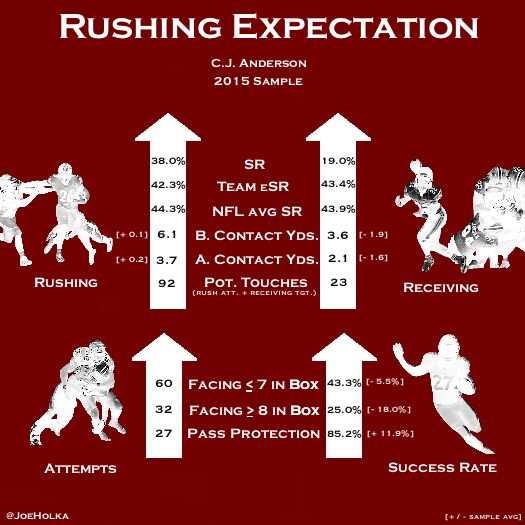 Anderson ran behind what was statistically a middle-of-the-pack offensive line in 2015 and performed below expectation by -4.3% per attempt, and well below expectation per target (-24.4%). Anderson’s lack of rushing efficiency put him third-to-last in my entire 20-player sample in regards to percent above or below expectation. He finished barely ahead of Jeremy Langford (-4.7%) and Latavius Murray (-6.9%), two players whose efficiency struggles are much more commonly documented. Before Contact Yards are something I discuss at length in my introduction to Rushing Expectation. Elusiveness behind the line of scrimmage is an extremely underrated, but prevalent, ability among the league's best feature backs. Anderson’s before contact yards (rushing) of 6.1 yards per carry was above average. This is a very positive indicator to me that Anderson is much better than this sample has shown. After first contact, Anderson posted an above average 3.7 yards per attempt. He has above average power, with a very low center of gravity. He rarely gets knocked backwards. His balance through contact is very good, and he has especially flexible hips that allow him to let his blocks develop, press holes, and get downhill in a hurry. Anderson had the fifth-worst efficiency drop-off in my sample when going from seven or less in the box to eight or more (-18.3%). Melvin Gordon was a full 5.5% below the sample average against base defensive sets, and 18% below sample average against eight or more in the box. Both were far below expectation as well. Anderson actually faced a loaded box 34.8% of the time in 2015, far more frequently than average, and fifth-most of my initial 20 player sample. Being an asset in pass protection is an undervalued part of Anderson’s game. He is a very good blocker and performed above average in this category at 85.2%. After re-signing for big money with the Broncos (and after they nearly let him get away), Kubiak and the organization have made it very clear that Anderson is ready to be their every-down back. I am confident that if healthy, he will get as much work as he can handle in 2016. He cut weight this offseason, and we have heard a constant drumbeat since camps started of Anderson being in phenomenal shape, looking lighter, and noticeably faster. The Broncos offense projects to be extremely run-heavy behind their newly revamped offensive line. What doesn’t gain enough steam in a situation like this is that not only does a good running game help the defense; the defense helps the running game. The Super Bowl defending Broncos will still have one of the top defenses in the league that will benefit from the rest they are getting as Denver pounds the ball on the ground. The biggest obstacle for Anderson could very well be that the offense will battle through possibly the worst situation at quarterback in the league. However, it is hard to argue that is much different than last season. Maybe it will prove to be a mistake, but the strong defense and high rushing volume narrative for Anderson holds much more weight with me in this situation. Even if the Broncos struggle as a team, Anderson was not game script-dependent in 2015, accumulating a higher percentage of total targets when the team was trailing or tied (52.8%) and getting a higher percentage of total carries in games not considered in positive game script (51.9%). There is no question Kubiak wants to run the ball a ton. The difference is, unlike a lot of situations, it will not be with a committee. Ronnie Hillman is most likely not even going to make the final roster, and there is no third-down threat as of now. Rookie Devontae Booker is a three-down back that closely profiles Anderson and is very similar in skill. What this tells me is that Kubiak is going to ride Anderson until he is tired, and then spell him with Booker because he can do a lot of the same things. However, Anderson has been great at the goal line in his career and I don’t see Booker ever taking over that role with the amount of money the team just invested in Anderson. Anderson's was not the most impressive Rushing Expectation performance by any means, but I am extremely bullish on Anderson in 2016, especially at his current ADP. I truly believe Anderson has the reasonable potential to lead the league in rushing yards this year. We’ve seen Anderson be one of the best backs in the game when healthy, and if he can put a full season together, I see no reason that his profile from a metrics perspective won’t improve. Rushing Expectation: Dion Lewis - Clearly Elite, But Is He Worth The Stash?